These are my husbands most favorite appetizer ever. At least I'm pretty sure of that. We first made them for our superbowl party back in January, and then had them again last night when some friends came over to check out some of our renovations. I originally found the recipe on allrecipes.com, and have since modified the steps a tiny bit to my liking. 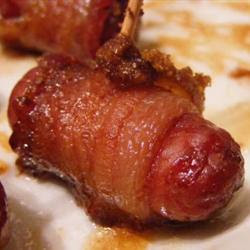 For your ingredients you will need a pound of little smokies, a pound of bacon and as much brown sugar as you would like. Also gather some tooth pics. First soak your toothpicks in water so they don't catch on fire. Cut the bacon slices into thirds and lay them out on a flat surface (we used a cutting board). Then sprinkle brown sugar onto the bacon. Finally roll up the little smokie in the bacon and secure with a toothpick. Preheat your oven to 350 degrees. We like to arrange our smokies on a broiling pan so that any grease and juices goes to the bottom, and doesn't make the bacon soggy. I also sprinkle a little more brown sugar over the smokies before sticking them in the oven, just for good measure :o). Bake the smokies for 20 minutes. Then switch your oven to broil and leave them in for another 3 to 5 minutes, until the bacon gets crispy. We have used both a crock pot set to warm, and a chafing dish to keep the smokies warm throughout the party. At our superbowl party we made two pounds of smokies, and they were gone by half time. Hope you enjoy! Holy cow. Until I uploaded this picture I seriously had no idea my belly had actually gotten this big. It must have happened last night. In regular clothes it still doesn't really look like anything, but it is definitely growing! I just hope that it rounds out in the next couple of weeks so I get out of this my pants are too small but maternity pants are too big phase. The BeBand and I aren't friends. My newest weird happenings from pregnancy? Carpal tunnel syndrome. Yep, on Thursday I was laying on the couch minding my own business, and then my left hand went all numb and tinglyish. Of course I yelled for Chris and he performed a little doctor check, and since my pinky and one side of my ring finger was still feeling normal, he determined it was carpal tunnel. I immediately consulted my 'What to Expect' book, and what do you know. Women can begin experiencing symptoms as early as the third month. It seems to have gone back to normal for now, but we are guessing it will probably come and go for the next oh, five months. Gender: I have no idea! Lets just say I'm starting to feel disgusting. I've never been a tiny girl with rock hard abs, or a super super flat stomach, but my midsection has never been a problem for me. Usually its my backend causing all the problems with jeans, but this itty bitty baby bump makes me hate all denim. I wish I could wear sundresses or sweats all day everyday. And surprisingly I lost a pound since last week. Who knows, my body is nuts. I told Chris I look like I ate too many hotdogs (I have no idea why I decided it was hotdogs) but nonetheless here is my baby bump as of today. 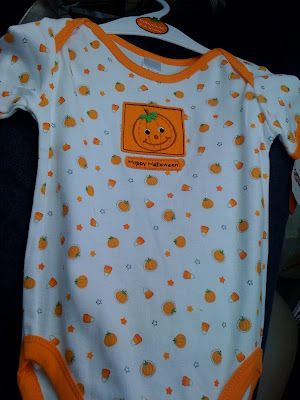 This week baby is roughly the size of a naval orange, 4 in from head to rump and weighing in at 2.5 oz. The baby is nearing normal proportions, with the legs now outmeasuring the arms. All four of the limbs have functional joints. I can't wait to feel them moving! Other random notes, did you know being pregnant can change your vision? I wore glasses as a kid, but pretty much grew out of them by highschool and had 20/20 vision. Over the past week or so I've noticed it is harder for me to get things into focus, so I asked the doc. She said yep, the baby can do that to you! Really? She said it had something to do with the change of hormones and pressure in my body. Oh, and I might not want to bother getting any glasses or contacts because it will probably change again when the little bugger comes out. Who knew. Sleep: it varies, I slept through the night twice this week! you cry at the sight of your husband. Not because of anything bad of course! Chris was on call three nights in a row, and thanks to my work schedule and his schedule I didn't see him from Tuesday evening until Saturday morning. When came in the door Saturday I started crying. I felt ridiculous but I was so happy to see him! you go to the grocery store, buy Pringles, and eat them on the way to McDonalds. Yes, it happened. Am I proud of it? Not exactly. I didn't go to the store just for chips, we bought a weeks worth of groceries. But while we were there I decided I really wanted McDonalds for dinner, however on the way I got hungry. So sue me. you are uncontrollably crying because you can't decide what to eat for dinner. Chris, being the sweet husband that he is, called me on his way home from the hospital to see if I wanted him to pick up something for dinner. Absolutely nothing sounded good. He was throwing out options, and even offered to go to the grocery store and grab steaks to grill. I didn't want any of it. And I cried, and cried, and cried. So he came home and gave me hugs and started rambling off a few more things I could eat. What did I end up with? Pancake and sausage on a stick. Chris went to the store and got it for me. You should try it sometime, the breakfast version of a corndog! phone commercials make you cry. Yep the commercial where the little girl loses her dog, and Tyler Hansbrough is sitting on her step with the dog when she gets home? Gets me every time. p.s. Mark your calendars! We should find out if baby J is a boy or a girl November 10th! This is going to be a long four weeks!!! 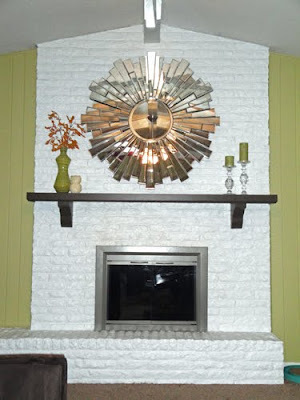 My fireplace recently got jazzed up a bit. Poor Chris spent just over two hours HAMMERING nails into the brick. The mirror had a wire on the back, and being round, the best way to hang it (supposedly according to a guy at Home Depot) were with these hooks that had brick nails. Lets just say nails do not hammer into brick easily. But I absolutely love the mirror! Now I am just at a loss of what to put on the mantel. 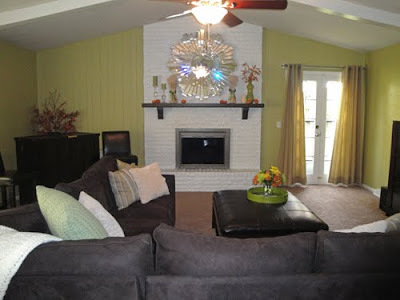 I'm thinking matching vases with something, but who knows. Any thoughts? Still not a lot going on at 14 weeks. 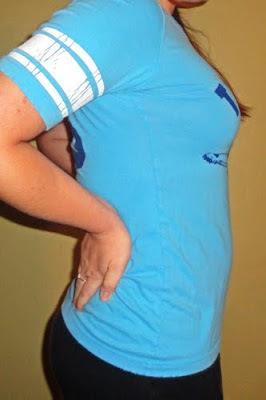 I honestly can't tell if I'm just showing some pudge, or if I can claim some bump. When I'm feeling extra large I just call it baby :o). The extra little bit by no means is a reflection of the two and half pounds (what?!?!) I gained this week. Crap... guess I have to actually start watching what I'm eating. This week baby is about the size of a lemon, 3.4 in long (from head to rump) and weighing in at approximately 1.5 oz. Baby is working on thumb sucking, toe wiggling, and wonderfully enough making urine. (Awesome, I feel so clean inside now!) The kidneys, liver and spleen are still working on developing. Go baby go! Gender: Meaghan dreamed it was a girl! There have been a few little updates in our house lately. 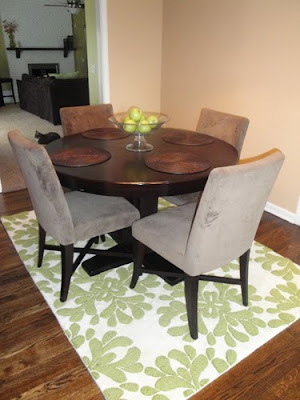 First, I received this beautiful rug that I ordered from Anthropologie. It looks great in our dining room! 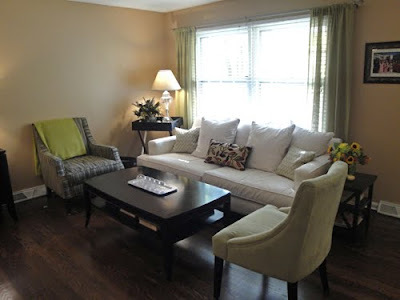 I wish it was a tad bit bigger, but the next size up would have covered basically our entire dining room, and I couldn't bear to cover up my beautiful hardwoods that much. 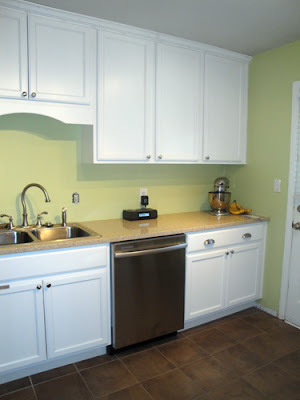 Also, hubby found some time to finally install all of our cabinet hardware. It is pretty simple, but I love it. Plus is makes the cabinets much easier to open! I have a few more new items to share, but they will have to wait until I a) clean up my house a bit, and b) take some good pictures. Here are a few pics from our ultrasound. 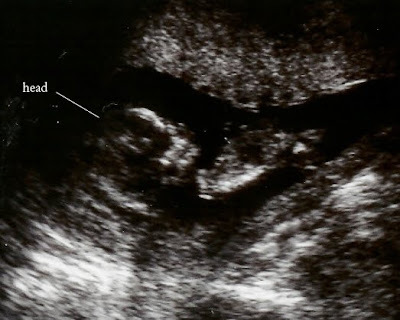 This was actually the second ultrasound I had, but the first one was at just over six weeks, and the baby looks absolutely nothing like a baby. So I figured this would do :o). In this first pic, no offense to baby, I think s/he looks pretty creepy. Baby is looking right at you. 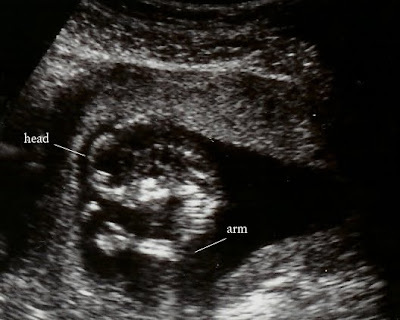 In this one you can see the back of baby's head, an arm and two hands. We actually had to have this ultrasound done twice. This first day we went in baby was constantly looking at as, making it impossible for the tech to get the measurements she needed. She even had me pee twice and jump up and down to try and get the baby to turn the way she wanted, but no luck. We watched the baby squirm around, A LOT! I didn't know such a little thing would be moving around so much. Baby even got the hiccups. It was absolutely hilarious. The only bonus to non cooperative baby? I got to see baby two days in a row. Day two baby was still extra wiggly, but the tech managed to get the look she needed. 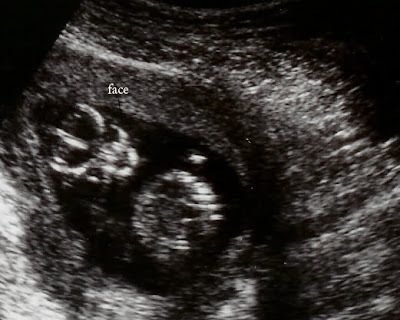 My mom came to the ultrasound... she said it looked like a crazy little boy moving around in there like that. I am going with it was a little girl dancing :o). I suppose we will find out in about six weeks or so! The picture on the left was taken at four weeks, and I didn't take another picture until yesterday at 13 weeks. I don't think I really missed much between now and then... other than some serious bloating around weeks 5 and 6. (I couldn't wear my jeans for like two weeks!) I think I'm looking a teeny bit rounder, maybe, or that could just be the shirt I'm wearing... and the fact that I'm wearing jeans... who knows. Movement: not that I can feel... but I know s/he is going crazy in there! Food cravings: fondue from the Melting Pot! Milestones: making it to 13 weeks... goodbye first trimester! Towards the end of May, very beginning of June we decided that we were ready to parents. We weren't in any big rush, just decided that we were going to let whatever happened, happen. So we picked up some vitamins and stopped preventing a baby from happening :o). Fast forward to July 17th, should be the start of my monthly fun. Nothing showed up so I took a pregnancy test. Definitely a negative. I was a little upset, but not crushed. Monday rolls around and still no sign of my monthly friend, but another pregnancy test comes back negative. I wait out the rest of the week, wake up Friday morning, take another test, it also comes back negative. At this point I've decided that because I'd only been off birth control for a few months (I stopped taking it in February, my new insurance didn't cover the particular brand of birth control I was taking) my cycle must be a little off, so I tried to calm my self down and let nature take its course. Throughout the next week I started becoming a little more emotional, and slightly agitated I guess, because it was so frustrating that nothing was happening. I kept thinking if I'm not pregnant lets just get on with this already! It was 5:15 in the morning (I can't say I'm a fan of the med school student schedule, especially when I don't have to work until 8:30!) on July 31st. Christin's wedding was this weekend, so seeing that my period still hadn't shown up, I decided I better take a pregnancy test just to make sure before I booze it up all weekend. With my eyes half closed I stumbled to the bathroom, pulled out a test and did my business. I washed my hands, brushed my teeth, and looked down just in time to see the blinking hour glass switch to PREGNANT. What? Seirously? I fully expected it to say not pregnant, and then I would have chucked it in the trash and crawled back in bed. I was completely shocked. I contemplated not telling Chris just yet, I had an idea to give him an early birthday present that evening, but knowing his schedule, the weekend ahead, and the fact that there about a thousand thoughts and emotions running through my head, I changed my mind. I walked into our bedroom, knocked on his bathroom door, and held the test up as he opened the door. The look on his face was priceless. Like he was completely confused at what he was seeing. Then he smiled and gave me a huge hug. Unfortunately he was then hurrying to get out the door and get to the hospital on time, while I was following him around the house saying "I can't believe it, seriously?". The rest of the day I was a ball of nerves because I was so excited, and so scared at the same time. the baby. My lack of blogging that is. I don't know whether or not it is a good excuse, but it is mine! Chris and I are expecting our first April 10th!